Since almost all uses of language are ambiguous and since this ambiguity can only be resolved sometimes, it follows that whatever is not resolved is interpreted subjectively. Since such subjective interpretations happen many time per day, it follows that individuals will tend to deal with unresolved ambiguity in idiosyncratic ways that tend toward becoming patterns in time. This results in what we call “personality.” Extroverts seek to define the moment by asserting meaning while introverts tend to wonder about that or just accept the meaning asserted by the extrovert. A paranoid person sees danger in unresolved ambiguity while a neurotic person worries and reacts to it. Having experienced early trauma associated with unresolved ambiguity, borderline personalities are acutely aware that something is wrong and often mad about it. Besides these rough categorizations, all people are molded by their habitual responses to unresolved ambiguity. Personality is little more than a name for our groping attempts to find or manufacture assurance and consistency in a world where little is certain. Instead of talking about our feelings or pasts, we would all do much better if we talked about how we talk and how we deal with the ambiguity inherent in virtually all significant communication. Language itself is neutral as a thing in itself, but they way we use it is not neutral. We assume too much and clarify too little. Parentheses around the word (intimate) indicate a spectrum from less to more intimate, less to more psychologically important. 1) If we study how (intimate) interpersonal language functions, we will discover that it is significantly both defined and impeded by errors in listening and speaking. 2) The more intimate interpersonal communication is the more idiosyncratic it is. Since (intimate) interpersonal communication is psychologically more significant the more intimate it is, it follows that it is very important to analyze and understand this kind of communication. It also follows that (intimate) interpersonal communication is harder to analyze from the outside the more intimate it is. It is essentially impossible for an expert to tell two lovers what their words mean or how to understand their acts of communication. Therefore, the lovers must do it themselves. The expert can only show them how to do it themselves. 3) This is a fundamental truth that rests in the nexus between language and psychology: the more intimate the communication the more important it is psychologically and also the more important it is that the communicators be able to analyze their communication satisfactorily and correct errors that inevitably occur. 4) How to do that can be taught. This is a good job for psychologists. Doing the analyzing and correcting is the job of the intimate communicators. 5) If (intimate) interpersonal communications are not analyzed and corrected; if errors are not discovered and removed from the system, the psychologies of both communicators will be harmed. 6) Conversely, if (intimate) interpersonal communications are analyzed and corrected; if errors are discovered and removed from the system, the psychologies of both communicators will be benefited. 7) Indeed, removing error from an (intimate) interpersonal communication system will result in gradual optimization of both the system and the psychologies of the analyzers. There is no other way to accomplish such sweeping improvement in both communication and individual psychology. There is no outside way for intimate communications to be analyzed and no one else to do it but the intimate communicators themselves. This is a fundamental truth that applies both to intimate communication and psychology. And this makes perfect sense because psychology is determined by intimate communication and vice versa. 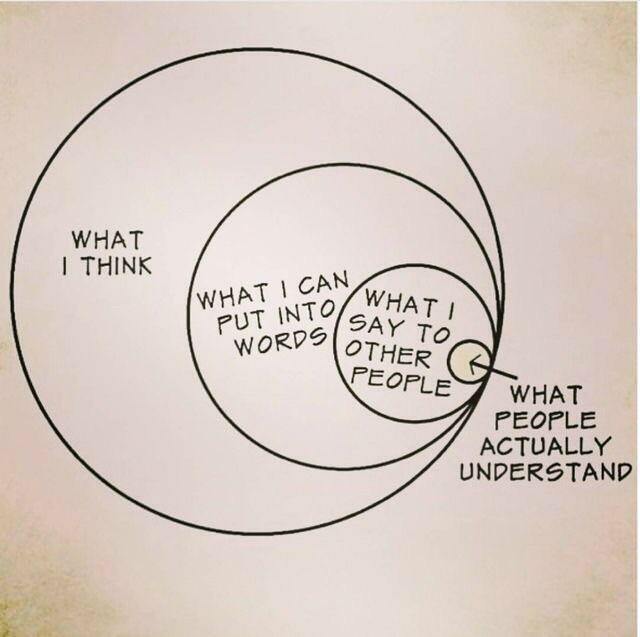 It is typically an illusion that the speaker knows “what other people understand,” let alone what they think abut what they thought they heard. Interpersonal communication is always fraught with ambiguity, misinterpretation, misspeaking, and mishearing, among many other errors. Even very close friends who know each other very well will make at least several significant mistakes in any given hour of interaction. Even close friends use conformity—indeed, require it—to overcome communication errors which inevitably occur in one or more of the circles described above. Yet conformity can also be a serious hindrance to deep communication between close friends. This fact is a central paradox of profound interpersonal communication.